Florence Westphal, 87, of Indian Trail Road, Holy Cross, town of Belgium, Wisconsin died peacefully at her residence with her daughter and granddaughter at her side, Thursday, September 22, 2005. 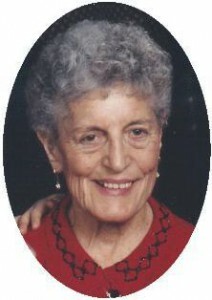 She was born March 6, 1918, daughter of Alex and Mary Matyas Boyne in Aurora, IL. She grew up with her Rumanian heritage, working hard and making ends meet. On July 6, 1941 she married Gerald C. Westphal of Sugar Grove, IL in Miami Beach, FL. Her husband was a member of the US Coast Guard and seaman by trade, so the family spent many years up and down the east coast. She raised two children and held the family together. In 1965 they moved to Holy Cross to a little farm house. Florence fixed it up from the ground up. In 1971, she cooked for a couple Great Lakes boats and later gained her Maritime Merchant Mariner’s license for on the Great Lakes. She had been chief cook on tug boats, usually for a crew of about 20, throughout the Great Lakes retiring at the age of 73. She learned to drive at age 54 and enjoyed swimming at the YMCA for many years. She loved nature, the outdoors, her dog Corky and had a zest for life. She would always find the positive and try to share happiness with others. She always dreamed of going to Hawaii. A few years ago it was realized with her daughter. She will be remembered for her strong will, friendliness and especially her sense of humor. She is survived by her daughter Dolores Penkwitz of Holy Cross, her son Gerry (Penny Irby) Westphal of West Allis, 4 grandchildren Katherine Westphal, Vanessa Schwengel, Robert and Michael Penkwitz, her brother Michael Boyne of Aurora, other relatives and friends. She is also preceded by sister Velma and brothers John, Alex, Andy and Lou. Funeral services Noon Monday, September 26, 2005 at the Poole Funeral Home. Chaplain Bob Lantz of Heartland Hospice will be the officiant. Interment Wood National Cemetery, Milwaukee, Wisconsin. Visitation 10AM – Noon at the funeral home Monday.